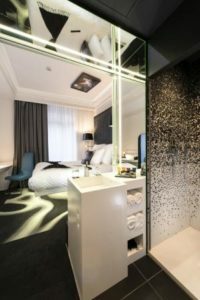 This ultra – modern hotel is centrally located in Dijon and boasts a black and white colour scheme, with quirky interiors packed full of surprise features courtesy of a number of French designers. All rooms are air-conditioned and the hotel benefits from an indoor swimming pool and sauna, meaning guests can relax during their stay. Just a 10 minute walk from Dijon Ville station and less than 10 minutes from Saint Benigne Cathedral, and the Musée de Beaux Arts, the hotel benefits from an ideal location to explore the city. Place François-Rude is also only a short stroll away and is a central area with stunning traditional houses, a fountain in the square, and many bars and cafés- this is extremely popular amongst locals on summer days. Valet parking at the hotel is payable directly at a rate of €15 per day. The exterior of Hotel Vertigo Dijon resembles a late 1800 Parisian style, yet inside reveals a chic and contemporary design. The hotel provides guests with a unique travel experience and boasts many premium services. The Embassy Bar caters guests throughout the day, serving buffet and à la carte breakfasts and transforming into an elegant bar in the evening, where they serve vintage Burgundy wines, Champagne and cocktails as well as gourmet tapas dishes. The hotel has its own spa area, featuring an indoor pool, Turkish baths and a sauna as well as a fitness centre. 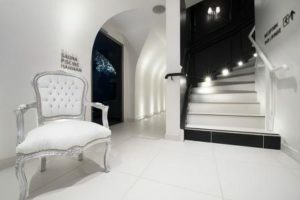 There is also a 24hour reception, in house cinema projection room, complimentary BMW electric bike hire (recommended to be booked in advance), dry cleaning and many other services available. Enjoy one of the hotel’s 42 designer rooms and Suites; all room grades include air-conditioning, soundproofing, a Mac mini with WIFI connection, interactive 40 inch mirror TV, a universal charger, and a mini bar. The bathroom comes with a shower, bath robe, and complimentary toiletries. There are four room grades to choose from at this hotel: Cocoon, Merveilleuse, Sublime Twin or Magique Suite. 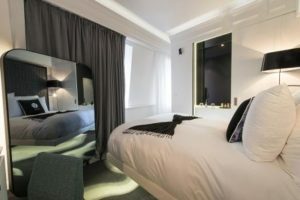 Cocoon rooms feature a double bed and open plan bathroom, Merveilleuse provide double or twin rooms and more space. In a Sublime Twin room, the space increases further and you will experience Vertigo’s signature floating double twin beds. Alternatively you can opt to enjoy the ultimate stay in a Magique Suite – where a generous layout provides you with separate living and bedroom areas; a dressing room, fireplace, a whirlpool bath and separate shower, king size bed as well as a double sofa bed.